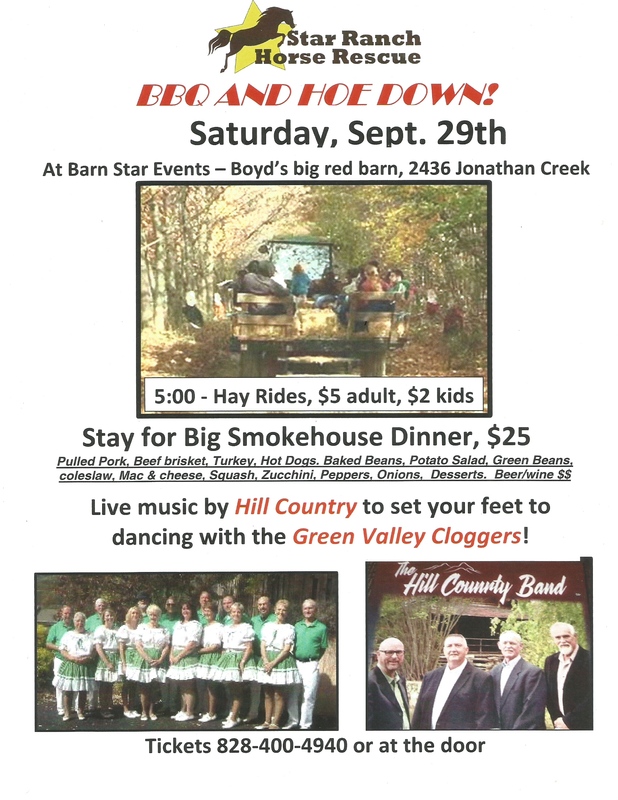 Home » News/Events » Hoe Down, Hay Ride & BIG Smokehouse Dinner Saturday, Sept 29th, 2018! STAR Ranch Hoe Down, Hay Ride, & BIG Smokehouse Dinner! Where: Barn Star Events – Boyd’s Big (and beautiful) Red Barn. When: Saturday, Sept 29th, 2018. Hay Rides start at 5pm then stay for the BIG Smokehouse Dinner! Promise you won’t leave hungry! Including Pulled Pork, Beef Brisket, Smoked Turkey, Hot Dogs, Baked Beans, Potato Salad, Green Beans, Coleslaw, Mac & Cheese, Squash, Zucchini, Peppers, Onions, Multiple Desserts, Fresh Apple Cider, Beer and Wine! The Hill Country Band and dance along with Asheville’s Green Valley Cloggers! Why: For the Love of Horses (of course)! Every $5 is another bail of hay for horses in NEED of your love & support! How: Purchase tickets in advance securely through PayPal for $25/ea. Please Click and Share the flyer below with all the details and see you there!